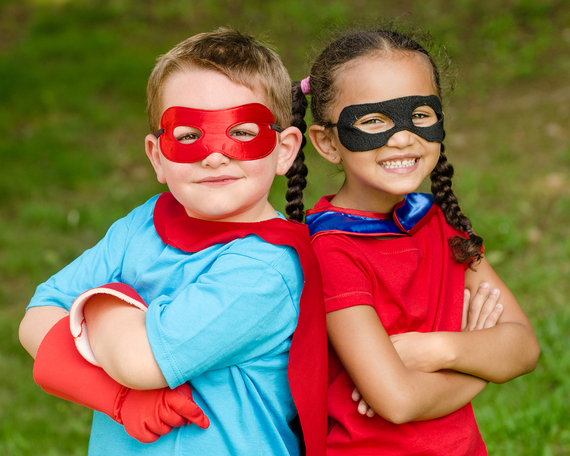 Divorcing parents: you can be super heroes to your children. Here's the plot twist: becoming their super hero means accepting that your children deserve to experience both a "Super-Mom" and "Super-Dad." Your marriage is ending, but your relationship as co-parents continues. Super hero status depends on whether you exercise your powers to communicate positively with your children about their other co-parent. They need your permission and encouragement, demonstrated by all of your words and actions, to enjoy their relationship with your ex-spouse and feel supported for doing so. This may sound flat-out horrible to you! The worse it sounds, the more you probably need to hear it. Amidst the overwhelming challenges presented by your divorce, your first act of heroism is to begin thinking about one another as co-parents, and move away from "ex-talk." Your number one priority now is to make the healthiest possible choices--big and small--for your kids. Please consider these four commitments you can make as co-parents that will change the course of your children's lives and in the process, possibly save yours too. 1. Begin to access your super power--choose a healthier divorce. The best decision divorcing spouses can make is choosing divorce mediation, instead of an ugly street fight in court. Most legal battles cause harm to your children. Litigation encourages spouses to become enemies. The increased intensity and duration of conflict can damage your child's development and cause serious long-term problems. Consider how doubling-down on negative feelings about your spouse in a divorce war might affect your children, who need both of you as a source of love and stability in their lives, especially during a time of epic change. In divorce mediation, you and your spouse together, with the help of a qualified neutral mediator, will address all of issues that a judge would decide: property and debt division, support issues and child custody (in mediation called a "parenting plan"). By avoiding court and engaging in respectful communication, you will stay in control of your own future and lower your family's stress level. This is your first step--and an essential one--toward building a more peaceful co-parenting future and setting the stage to become super heroes to your children. 2. Be truthful--but tell them only what they need to know. Child specialists agree that parents need to communicate honestly and in advance that the separation is happening, the reasons behind it, and what the future might look like for the family. While specific approaches vary depending on age, renowned child psychologist and pioneering custody mediator, Donald Saposnek, Ph.D., urges parents to agree upon a truthful, carefully framed "mutual story of the divorce." First, parents should tell their children together about the divorce. Children need to hear "one mutual and consistent story" about why and how the divorce will happen, according to Saposnek. Telling your children a "mutual story," in which neither parent is "bad," joint responsibility for the divorce is taken and personal details are spared, will help them view the divorce as a "family re-organization" rather than a "break-up." It will allow them to bond with both of you within the re-organized family from the outset. For example, instead of Mom telling the children that the divorce is a result of Dad's cheating and lack of care for the family, and Dad telling the children that Mom has been mean to him for years, a "mutual story" would focus on how much Mom and Dad both love them. It would also express how they will always be safe and cared for, and that although this may be difficult for everyone for a time, everything will be okay. "Mommy and Daddy tried as hard as they could to live happily together but we have grown-up problems that we just can't fix, so we've both decided that we shouldn't be married anymore. We will always love you and take good care of you and be your Mommy and Daddy. You need to know that our divorce is not your fault. You haven't done anything wrong. We are both very proud of you. Even though Mom and Dad will live in two different houses, you will see us both and we will keep loving you, and taking care of you and will each have special time with you. We both agree that it is important for us not to fight anymore and that we will be happier living in separate places." The "tell them what they need to know" approach applies after your divorce too. Spare the details as questions may arise or bumps occur in your co-parenting relationship. Agree on how you may need to elaborate on the mutual story as time goes on. 3. Never argue with or criticize your co-parent in the presence of your children. The true hero is a parent who prevents an argument from occurring in front of their children, not the parent who wins an argument. Never argue or fight with one another in front of your kids. It is a sin against their childhood. There is no excuse for it. So, learn to control yourself. Perhaps agree with your co-parent on a "code word" for when tense moments arise that signals: "we-both-need-to-STOP-NOW-because-continuing-will-permanently-damage-our-children." Whatever it takes. Speaking negatively about or criticizing your co-parent within earshot of your kids is equally harmful. Many child experts would call it "emotional child abuse." When you attack your co-parent, you are also attacking your children. This makes sense because children view themselves as being a part of both of you. A condescending comment or a display of anger about your co-parent will cause unnatural stress on your children and can make them feel belittled and lower their self-esteem. You are still entitled to your feelings and need to express them, but not to your children or anywhere near them. Beware: They can probably hear you talking on the phone in your house, or with a friend or relative while they sit in the backseat of your car. 4. Proactively support your children's relationship with your co-parent. In addition to shielding your children from negativity, by positively reinforcing your co-parent when communicating with your children, you will advance healthy child development. I'm not claiming that it will be easy! In order to "talk the positive talk" with your children, it helps to "walk the positive walk" with your co-parent. First, get yourself in the right frame of mind. Keep reminding yourself that your goal as a parent is not to win a popularity contest. Even if it were, omitting opportunities to positively support your co-parent would not help you win one in the end. Understand that for a while you may need to just "go through the motions" of practicing positive communication. Second, find consensus with your co-parent about fostering a supportive co-parenting relationship. Agree that your children have an absolute right to a positive and full relationship with both of you. Agree that you will both look for ways to support your children's relationship with the other, regardless of your personal feelings at any given moment. Agree to continuously communicate with each other about child's needs. Building this foundation of mutual understanding may allow positive communications about your co-parent come more naturally. If you've undertaken divorce mediation with a sophisticated mediator, you'll lay the groundwork there. Many co-parents also greatly benefit from the expert advice of a therapist or social worker, during or post-divorce, who specializes in healthy co-parenting. And finally, just do it. Here are some tips. 1. Refer to one another "Mommy" and "Daddy" or "Mom and "Dad" rather than "your Mom/Mother" or "your Dad/Father." 2. Sincerely encourage your children to call or FaceTime the other during your own parenting time. 3. Celebrate the time, activities, and fun moments your children had with your co-parent. "I'm excited to hear what you and Daddy did this weekend! ... Wow, you went to the train park--that must have been so fun." "Cool new backpack. Did Mommy get that for you? I love it." 4. Have a photo--or a few--of your children with your co-parent in your home. It can be a reminder that you are both there for them, wherever they go. You can be clear that even though you and your co-parent are no longer married, you still respect one another as co-parents. 5. Make a list of ten positive memories or good characteristics of your co-parent. Share them, one by one, when the time is right. Repeat them too. You might tell the story of your co-parents' reaction when your child was born, a time your co-parent did a good deed for someone else or share a talent that your co-parent possesses. The most heroic gift you can give your children is taking every opportunity possible to speak positively about your co-parent. Divorce in itself will not likely damage your children. However, how you choose to get divorced and behave after your divorce will make the difference. Choose to be super heroes to your kids. In doing so, you may also discover that you are the greatest super hero to yourself. Michael Aurit, JD, MDR is a professional mediator, attorney, and Founder of The Aurit Center for Divorce Mediation in Scottsdale, Arizona. He is a member of the American Bar Association Dispute Resolution Section (ABA-DR), The Academy of Professional Family Mediators (APFM), The Association for Conflict Resolution (ACR), and the Maricopa County Association of Family Mediators (MCAFM). He holds his Juris Doctorate from Pepperdine University School of Law and Masters of Dispute Resolution from the Straus Institute for Dispute Resolution at Pepperdine. To learn more, visit AuritMediation.com or contact Michael at michael@auritmediation.com. *The "Superhero Parents" concept was notably inspired by Alternative Divorce Solutions' advertisement in Locale Magazine, Page 86, January 2014.